Koji Oikawa began studying the piano at the age of four. In 1984, he was awarded first prize at the Viotti-Valsesia Concorso Internazionale de Musica. In 1985, he entered the Kunitachi College of Music and, in the following year, 1986, studied at the Bulgarian State Conservatoire. While attending the master class of Alexis Weissenberg in 1987, Oikawa was given a special prize established by Weissenberg himself and a grand piano for his personal use. In 1990, he won the first prize at the Marsala International Music Competition and, in the same year, received an Honorable Mention at the Chopin International Piano Competition. 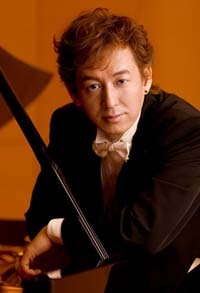 In 1992, he was awarded the second prize at the International Music Competition of Japan. Oikawa held his debut recital at Suntory Hall, Tokyo in 1995. In the same year, he debuted in Paris, having been invited to perform at a subscription concert of the Orchestre des Concerts Lamoureux (Yutaka Sado, conductor; Salle Pleyel). Since 1997, he has been violinist Midori Goto’s partner pianist in the educational music programs of Music Sharing (formerly Midori and Friends) and has toured elementary schools and schools for disabled children in Japan with Goto. In 1998, he performed at the Sapporo PMF (Pacific Music Festival). In 1999, Mr. Oikawa held a nationwide tour under the title, “Chopin no tabi” (Chopin Journey), to commemorate the 150th year of Chopin's death. His tour drew as many as 35,000 people to become a major event of Chopin Year. From 2002 to ‘04, he again enjoyed occasions to perform throughout Japan: in June 2002 with the Staatskapelle Weimar as the Japan tour soloist, in July 2003 as a soloist with the PMF Orchestra, and in 2004 as a guest of the Yutaka Sado Young People’s Concert. Koji Oikawa is a highly accomplished, popular performer who is counted among Japan’s foremost pianists. His “Debut 10th Anniversary Concert” held at Suntory Hall in 2005 sold out and became a major success, and from 2008 to ‘11, he undertook a concert series project simultaneously in Tokyo and Osaka, “Koji Oikawa 10 Great Concerto Series.” In 2013, he appeared as the Japan tour soloist for the Moscow Philharmonic Orchestra (Yuri Simonov, conductor), performing Tchaikovsky’s Piano Concerto No. 1, and thereafter launched a nationwide recital tour, “Beethoven’s Five Great Piano Sonatas and Fur Elise.” In 2014, he joined the Berlin Symphony Orchestra as its Japan tour soloist, performing Beethoven’s “Emperor Concerto,” and as summer began, he embarked on a recital tour performing an all-Chopin program. Oikawa’s critically acclaimed performances are distinguished by a dynamic technique and exquisite sensitivity of touch that speaks directly to our innermost feelings. They have earned him a broad following. His teachers have included Sachiko Kodama, Minako Yoshimoto, Konstantin Ganev, Julia Ganeva, and Jean-Marc Luisada. He is currently a specially-appointed professor at the Department of Music, Miyagi Gakuin Women’s University. His CD discography includes collections of works by Chopin, Beethoven, Liszt, and Rachmaninoff, all of which are rated highly. His 2007 Beethoven: Pathetique, Appassionata, Waldstein and 2010 Chopin Ballades were both selected for the special recording prize of Record Geijutsu magazine. In 2011, he released a CD of recordings from his past albums, Koji Oikawa BEST.